Joe Davidian is a highly talented jazz pianist and native Vermonter who is currently living and playing in New York City. I’m proud to say that I watched Joe grow up as a player in the Vermont jazz scene, and I have followed his work with interest. 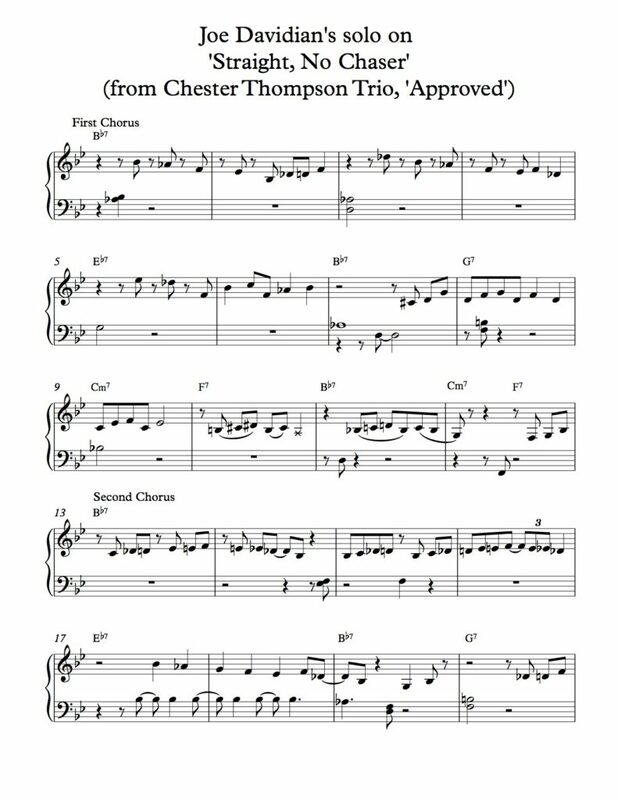 Below is my transcription of Joe’s solo on ‘Straight No Chaser’, Thelonious Monk’s B flat blues, from a version of the tune on ‘Approved’, an album Joe recorded in 2013 with a trio led by the drummer Chester Thompson, perhaps best known for his work with the band Genesis. One of my goals in this series of posts called ‘State of the Blues’ is to demonstrate that innovative improvising is still being done with standard left hand rootless chord voicings and with a sense of conversation between left hand chords and right hand melody. In the first two choruses, Joe combines sparse, conversational use of left hand voicings with an increasingly active right hand line, which for me recalls Wynton Kelly’s conversational style. In the third chorus, the left hand takes on a more active and supportive role. Joe’s solo both outlines the chord progression with great precision and makes wonderfully inventive use of Monk’s melodic motives while still managing to be fresh and surprising. Notice how Joe takes the one-bar idea he introduces in m. 8, moves it down a whole step in m. 9, and then creates what might be called ‘a wrinkle in time’ by playing a more stepwise version of it on the ‘and’ of beat one in m. 10 and on beat 2 in m. 11. Here the concept of multiple rhythmic repositionings of a single motive, which is a key element of the head to ‘Straight No Chaser’, is ingeniously used by Joe in his solo. It is worth noticing that Joe first applies Monk’s concept in the first chorus using an idea of his own, and then moves on in the second chorus to developing an idea related to the opening motive of the tune. Monk’s tunes are based on such strong, short and seemingly simple motives that they are great points of departure for motivic improvisation, i.e., improvising based on short melodic gestures. 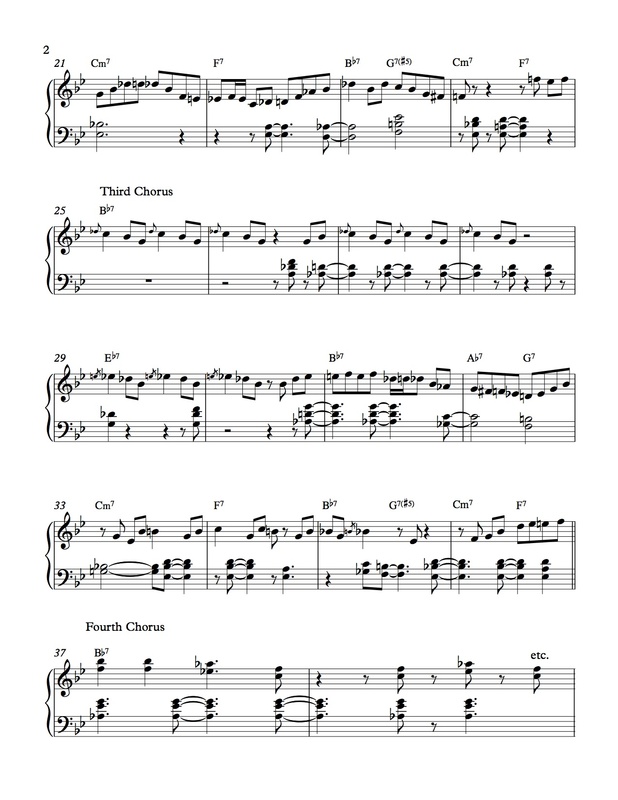 In a column archived at keyboardmag.com (the online remnant of the late, lamented Keyboard Magazine), pianist Fred Hersch wrote about soloing on Monk’s ‘I Mean You’ with a motivic approach, including a notated example with his own development of Monk’s opening motive. In the time between Hersch’s column and Joe Davidian’s solo, pianist Jon Batiste also recorded an interesting version of ‘Straight No Chaser’ which expands on the melody’s motives, both more abstractly in the fascinating intro (the bassline of which is almost a twelve-tone row) and the solo which, like Joe Davidian’s, elegantly models the concept of a relaxed conversation between left hand chords and right hand melodic lines. This entry was posted in The State of The Blues (solos on blues progressions). Bookmark the permalink.